I gave up the video game playing, TV watching lifestyle years back now. There just had to be more to life. 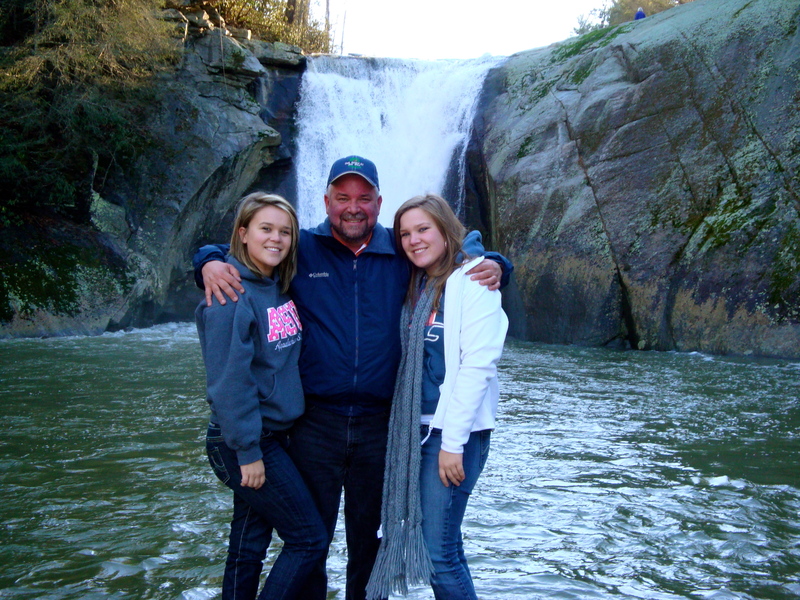 I discovered a love for waterfalls on Christmas day 2008, at Elk River Falls in Elk Park NC. While not initially realizing it, this opened a whole new world, and lifestyle for me. 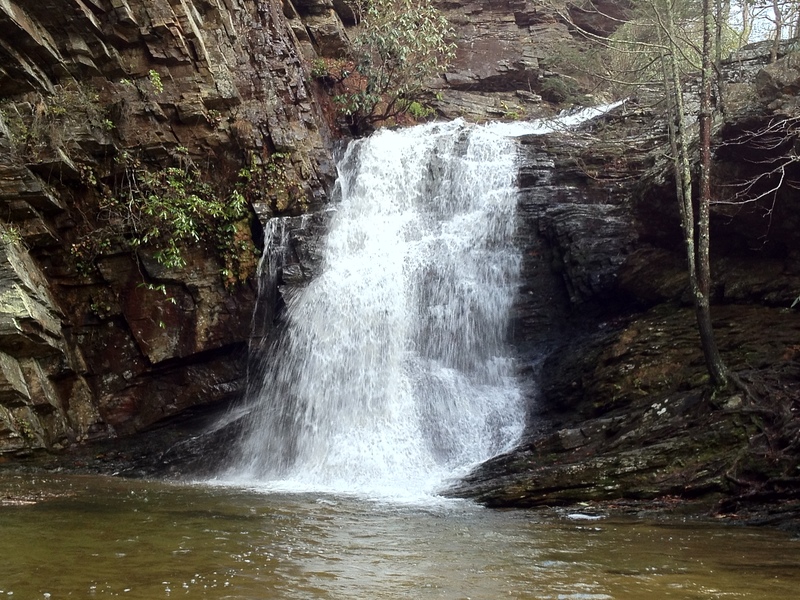 I now love to spend my free time, hiking to waterfalls, and mountain tops in search of pristine views. This has also led me to a love of photography and blogging. While i am still not an expert at either several years in to this, I love the challenges that both offer me. I see my skills getting better at both as time goes by. Sharing what I see via social media brings me great joy. I love the feedback, good and bad. I love to see what others are able to show as well. I created my blog "WaterfallsHiker", originally to just help myself keep up with my travels, not really with any real purpose in mind. After 2 years on this blog, I see that It has evolved into a combination of an information site, and a place to show off my progress as an amateur photographer. I try to do it all and include some bits of my personality as well. It is something I really enjoy doing. When I am not working on this hobby, I can be found on a golf course, spending time with my beautiful fiance and her daughter, or working my 40 hours a week at Costco. Today I begin a new section of my blog, giving some recognition to probably the most important highway in the Appalachian Mountains, the Blue Ridge Parkway or BRP for short. As I hike different sections of this monumental highway, I will simply begin the titles as BRP followed by the number representing the mile marker of the location of interest. The Blue Ridge Parkway winds 469 miles from Waynesboro, VA, to Cherokee, NC. At 45 mph, and even 35 in spots, it is not made to be a travel route for speed, but one to just get out and enjoy the views. It winds mainly along the ridge lines with a few peaks and valleys here and there. The mountains it spans always seem to be gentler on the vehicles than the roads and highways that intersect it. This is a national park, and aside from some specialty shops, cozy restaurants/coffee shots, and dated mountain lodges managed by park service, you will not find commercial signs or gas stations. It is best to have a map or gps, know where the next highway crossing will be and not let your fuel go too far below 1/4 tank. 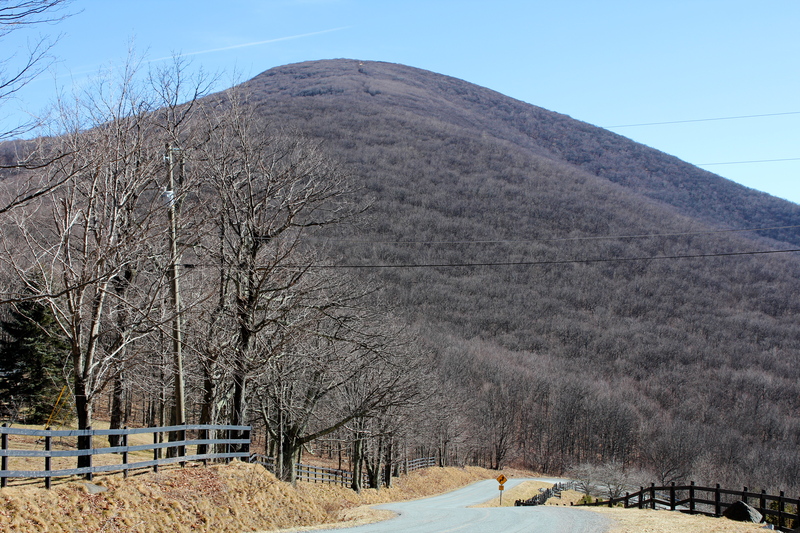 The Parkway is a haven of outlooks that are designed to pull off the road and get out to view. Some require a small hike up or down and most are well worth the time, but many are simply roadside spectacular views to get out and see and stretch the legs. Expect to come across deer, wild turkeys, beavers, foxes, raccoons, and possibly even a rare black bear siting. Living just an hour away from it, I have found over the years to enjoy bits and pieces of it, but have never made the entire trip. There is just too much to see and do. While this is a great adventure in the car, I find the true treasures that are along it, must me reached by hiking! First off, I should not be allowed to travel freely on the BRP in late January. Being a National Park and not a highway, it does not get plowed in winter and should be snow/ ice covered and closed in many sections. Some places up here receive up to 100 inches of snow in a typical winter. This is not the case this year in 2012, the winter that wasn’t. It is a toasty 60 degrees up here in the delightful mountain resort town of Blowing Rock, NC. I am going to visit the Moses H Cone Memorial Park at BRP Post 294. 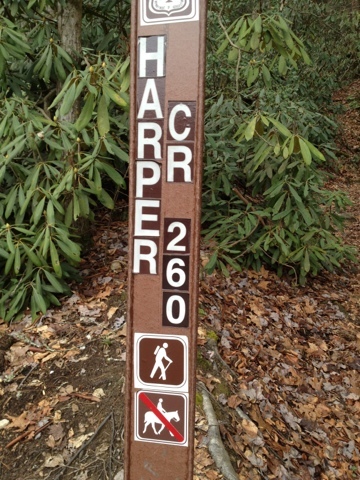 This is marked by a sign as you leave Blowing Rock and enter the mini-park area. It is a vast 3600 acres covering both sides of the Parkway. Today, I stayed on the side with the Cone Manor. Moses H Cone, a man that lived a relatively brief 51 years, was a giant in the textile industry, especially denim. His name is large in the triad town of Greensboro NC, having the Hospital and numerous medical facilities named after him, due to his large donations to his communty . I have also read that Mr Cone’s donations were also instrumental in founding Watauga Academy, or what is known today as Appalachian State University….Go Mountaineers!! 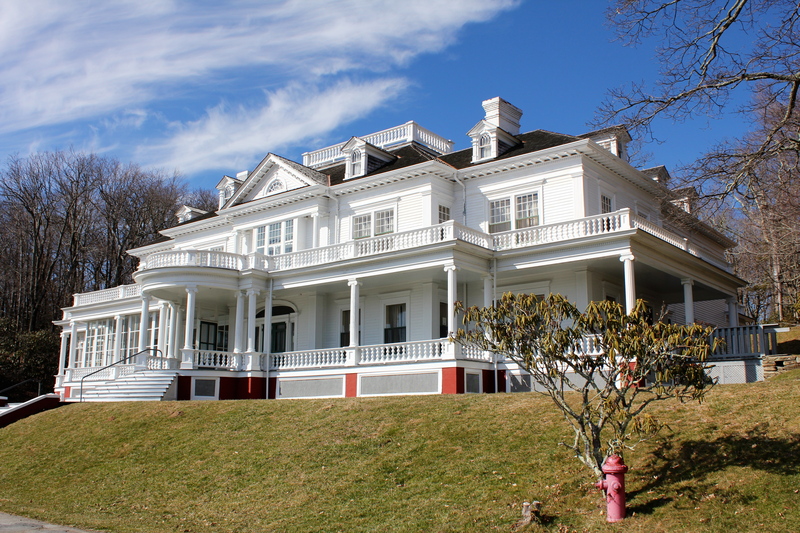 Somewhere about age of 40, he and his entourage, made their way to the NC mountains and had this incredibly impressive, large, and beautiful mansion built on top of a mountain near Blowing Rock. It goes by Moses Cone Manor, or Flat Top Manor. It’s impressive beauty and size stand out way below looking up. Today it is a craft center and receives 250,000 visitors a year. Another interest Mr Cone had was building “Carriage Roads” or trails wide enough and level enough for the horse and carriage to comfortably pass. There is a network of 25 plus miles of these carriage roads that today make for some of the easiest hiking in our mountains. After taking some photos and just conversing with a few other hikers, I started my journey along the “Figure 8” trail, which is just a little side trail next to the manor. It is short, with numerous info stations about the plant life that resides here. After this short trek, I began the journey down to “Bass Lake” which can be seen way below from the manor. The trail, or dirt road is nice enough and wide enough for a car, but it is strictly for hikers and horses. It conquers the elevation change by long, and level switchbacks. At about 2.2 miles, I reached the lake, and was amazed by the view from the lake of the mansion way…above it. It was a pretty day, and the blue sky made the scenery even nicer. There is a side trail that goes all around the lake, I did this of course and enjoyed every minute of it, I will note that it was some 10-15 degrees cooler down here surrounded by the cool icy waters. When I came to the point where the main creek enters the lake, I witnessed some very nice Beaver action, viewed a perfectly made Beaver Dam, it was very cool. It was now time to tackle the unavoidable, the hike back up… There were 2 ways back up, one that went through a 2.3 mile crazy route called “The Maze”, and a more direct route. With my hike approaching the 5 mile mark, I decided today to take the more direct option, but I will be back at a later date to tackle “The Maze”. There was one last stop on the way back at the large building known as the “Apple Barn”. While Moses Cone was here, he grew over 75 varieties of apples. Looking at all of the accomplishments this man had, he must have had an incredible “vision”. As I reached the top, I kept thinking, wow that was mild. His Carriage Roads were designed so well that there was never really a spot where it got steep, just a constant slightly uphill climb. It went almost unnoticed. At the end of the mild climb, the famous “Mountains To Sea” Trail joins in the finish the day. This was a nice break from the trails I have been used to, the ones that are much more narrow, with roots, rocks and tight spaces to navigate. I can see why this place gets so many visitors, which is another reason I have to visit it on a week day in January to really enjoy it, it is just too crowded. Check out my slide show below for some of the photos of the day…. It is just not a typical winter in North Carolina. Instead of inches of snow, and power outages, we are counting 60 degree days at the lower elevations, and going on some sweet winter hikes that we normally can not do. On a day that I had Roan Mountain in mind, Elk Knob crossed my view on my pc, and I realized that I have never been to this place, a location that was very close and accessible to the crossroads town of the northern NC mountains, Boone. Elk Knob State Park currently has 1 main trail to the Summit, a 1.8 mile climb that ascends 1000 ft. While this may sound rough, this was probably the most pleasant , easy to hike 1000 climb I have experienced. The trail is brand new, full of fresh gravel and switches back and forth frequently until you arrive at the summit. This summit is not full of crags and other rock formations to climb , it is just a nice grassy summit, that has a north and south view. I stopped in for a visit at the temporary visitor center. There was an sweet older lady working on this day. We conversed about the new park, how long it had been here. Sh gave me a very clear and accurate layout of the trail and what to expect. She was very accurate too. She told me that on a clear day like today, I could see 50 miles in all directions. One of the last things she told me was that the winds would be very chilly up there and that I needed something to cover my neck and ears…she was very sweet! Once the 1.8 mile ascent was complete, I remember thinking that I could not agree with her more. There was not one viewpoint up here, but two, a north view and a south view, both with amazing shots. Each one has a descriptive placard with a “virtual” map. It shows accurately which mountains you see as you change your direction of view. I think this is particularly a nice touch. Some mountains I could clearly recognize like Pilot and Grandfather, others, I might not have known. A cold front had just cleared the region the night before and it was a very clear morning, making the views sensational, almost indescribable in words and pictures. Some things, you really just have to see in person. On the north side, the top attraction to me was clearly the viewing of Pilot Mountain, which is actually over 90 miles to the east, well further than the 50 mile range I was expecting. Pilot has this large knob on it, which makes it one of the most recognizable landmarks in western NC. 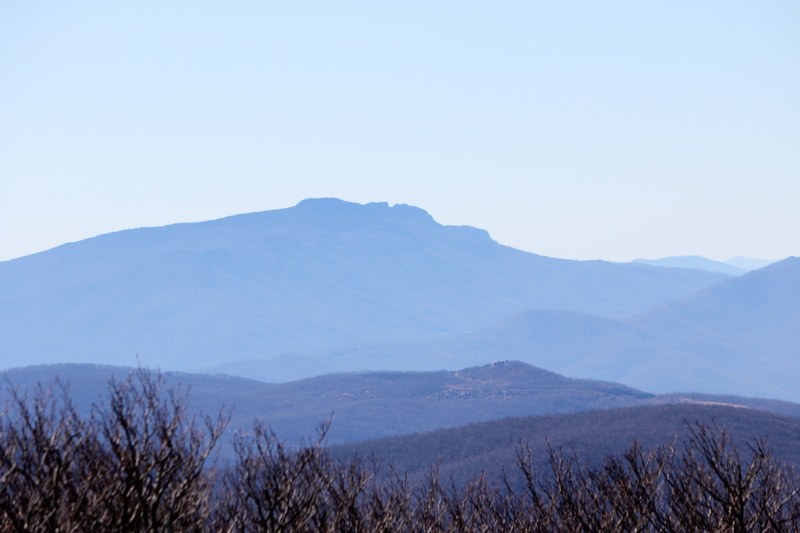 There are also some amazing views of Snake Mountain, Grandfather Mountain, and Mount Mitchell. 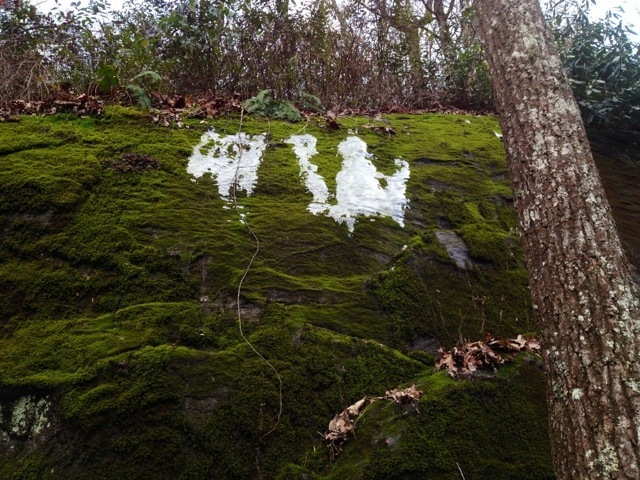 The ski slopes of Beech and Sugar Mountain were clearly visible and also displayed the only…..snow to be found, amazing for this time of year. At an elevation over 5500 ft, snow should be everywhere, I had a hard time finding any ice on rocks as well, it is just an unusually warm winter. Once back at the vehicle, I made the short commute back into Boone for lunch at one of the great local sandwich shops. 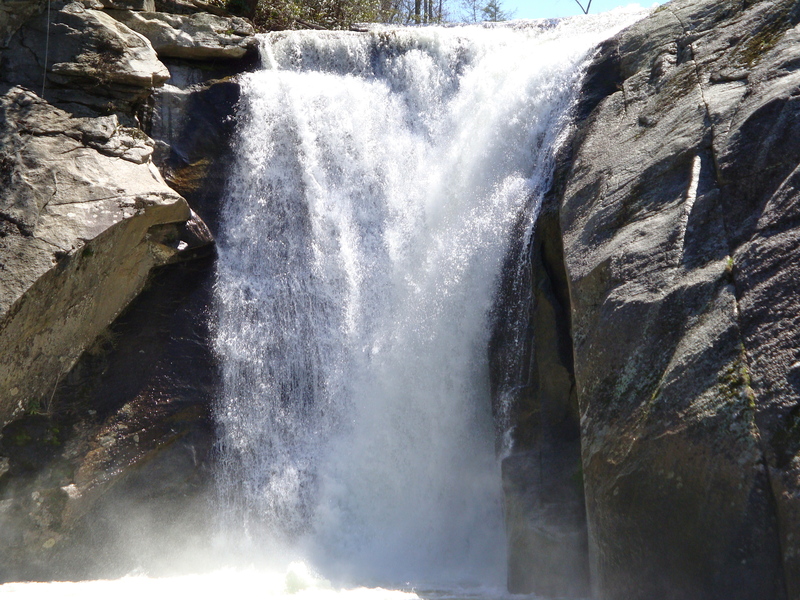 I did stop by for an afternoon visit at Linville Falls, so look for that to come soon. 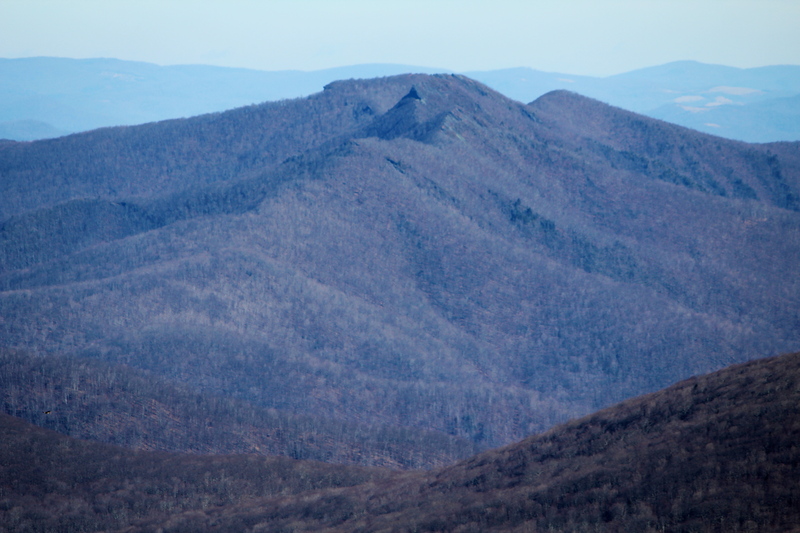 Elk Knob from the access road below, not much color this time of year, but the absence of leaves totally enhances the views along the hike!! 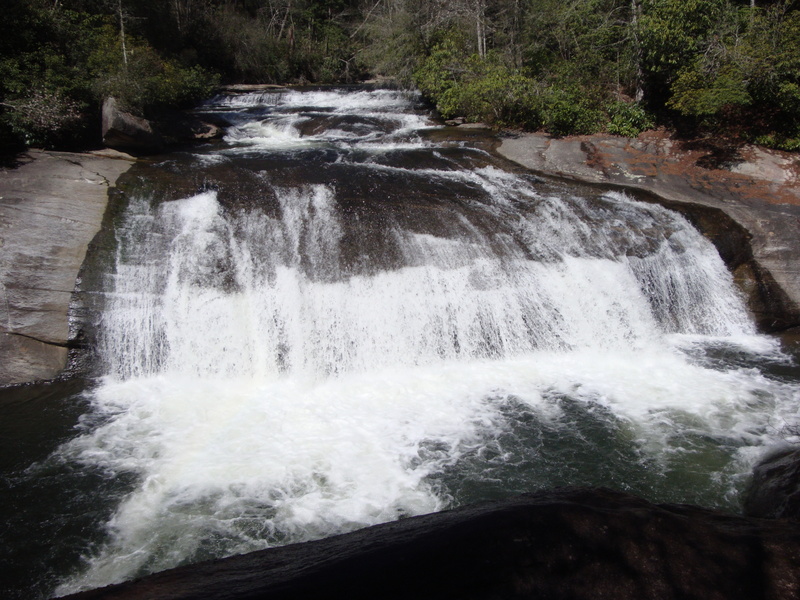 Rainbow Falls – Horsepasture River, North Carolina’s Finest Waterfall?? While I ponder where my next waterfalls hike will be, I would like to take a few minutes to share the best of what I have found so far in my travels. 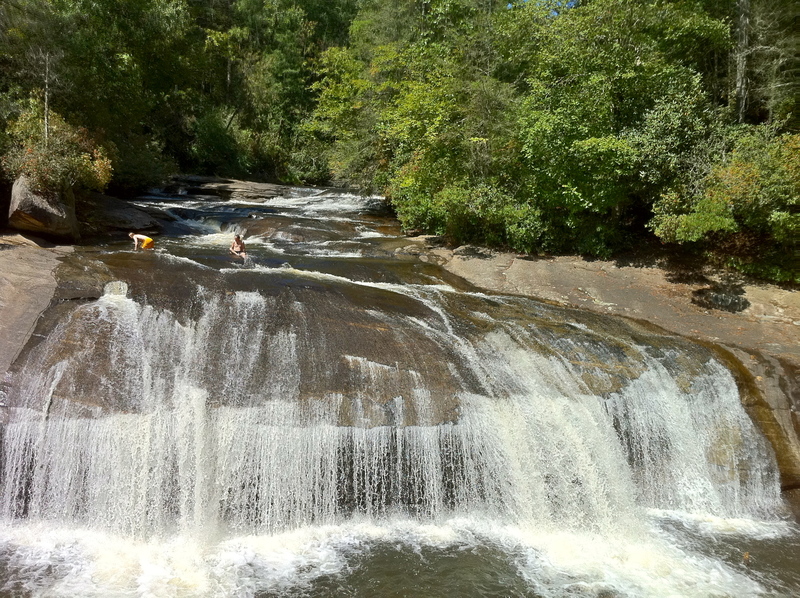 In the southwest corner of NC, deep in the “Land of the Waterfalls”, just outside of the fairly new Gorges State Park, lies the Horsepasture River. 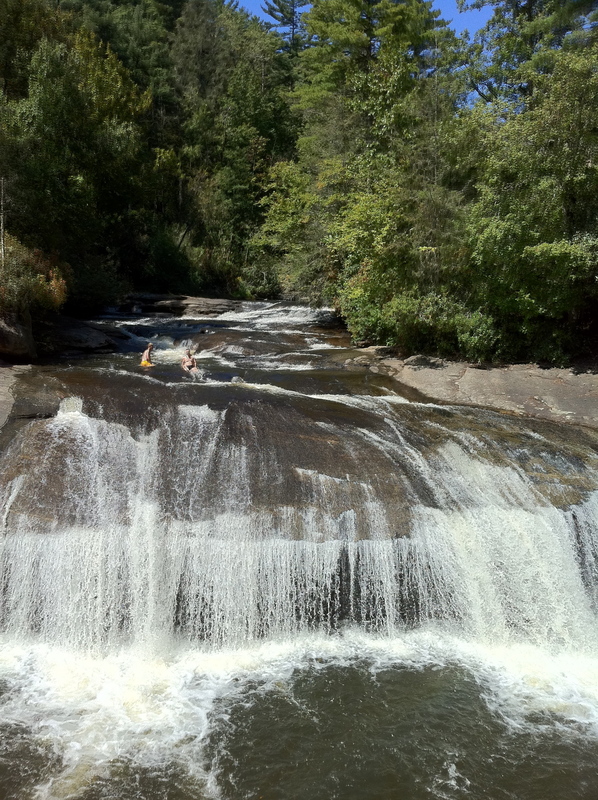 This river is home to the finest waterfall I have seen in person, Rainbow Falls. 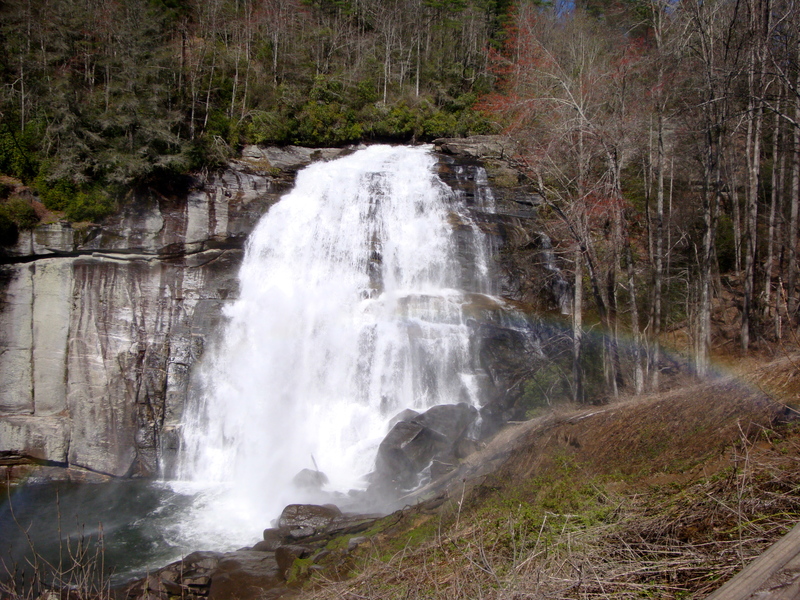 Rainbow Falls is a powerful waterfall, that falls 150 feet over a very wide open, large rock face. 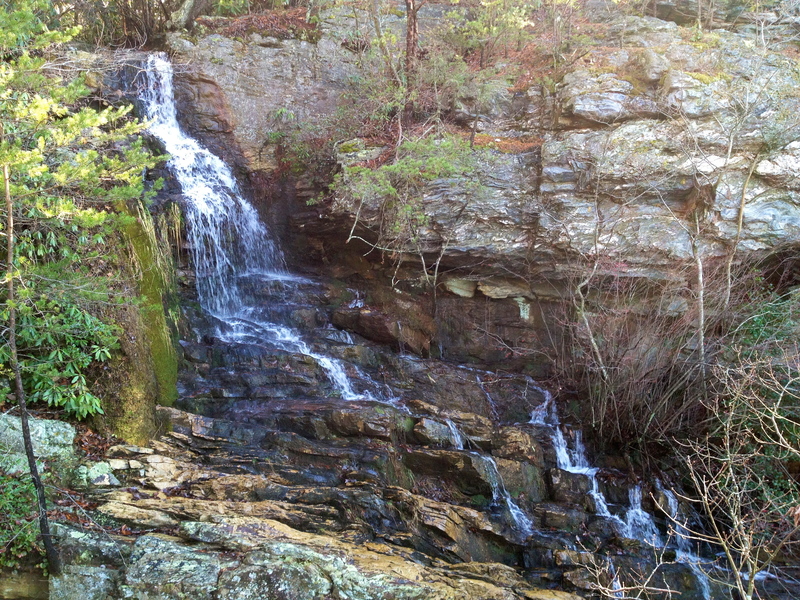 This waterfall is on a river, so there is usually plenty of water flow, even in dry times. When the water is up though, wow what a site!! 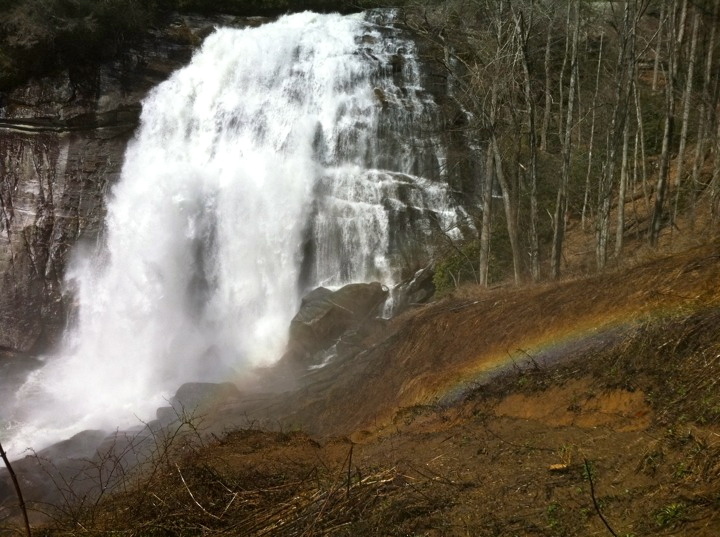 It is named Rainbow Falls for a special reason. The size of this river and the large amounts of water going over the falls, creates a huge spray zone that usually makes a B-line right towards the spot where most people view and photograph this waterfall. It will get you soaked if you stay there long enough, and it will surprise you because you are pretty high up with a good distance between yourself and the waterfall. 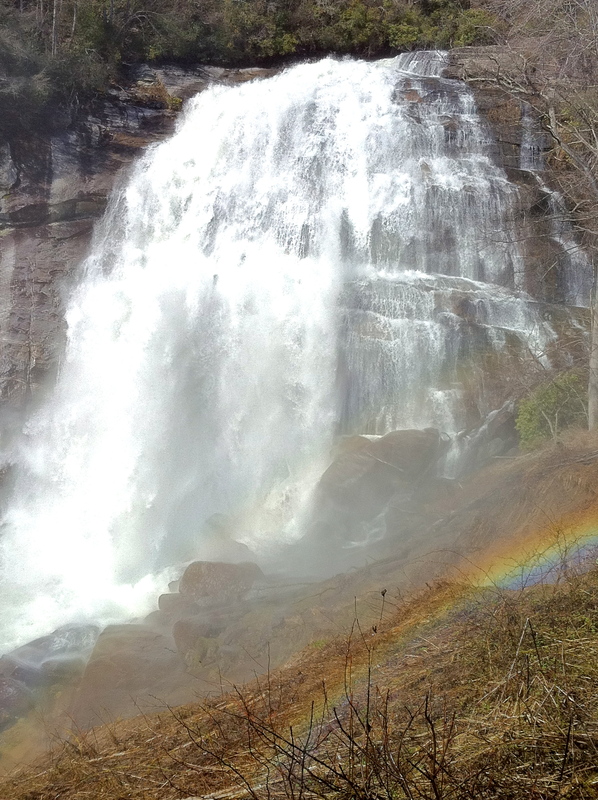 Anyway, when the sun is at the right angle, usually 9-10 in the morning from what I have found, the sun and the heavy waterfall mist create a huge rainbow that at the peak, will cover the entire waterfall. It is beautiful and truly something to see. It took me 4 times before I finally saw the rainbow, now I will plan any hike here to be at the spot between 9-10 am. The hike there can be challenging for some. There used to be an easy access right off of highway 281 that required only a short hike to get here. This is now private property and the owner has very intimidating signs everywhere threatening prosecution for trespassing. He or she does not appear to be playing around. So, the new option is to drive into the new Gorges State Park, which has a ton of waterfalls of its own that I will have to discuss on another blog, another day. 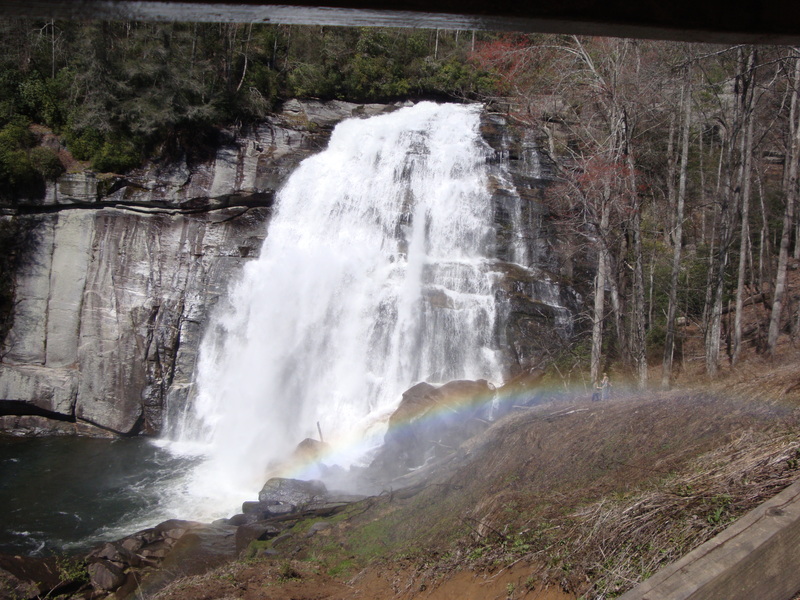 The Trail is called the Rainbow Falls Trail and is roughly a 5 mile round trip. 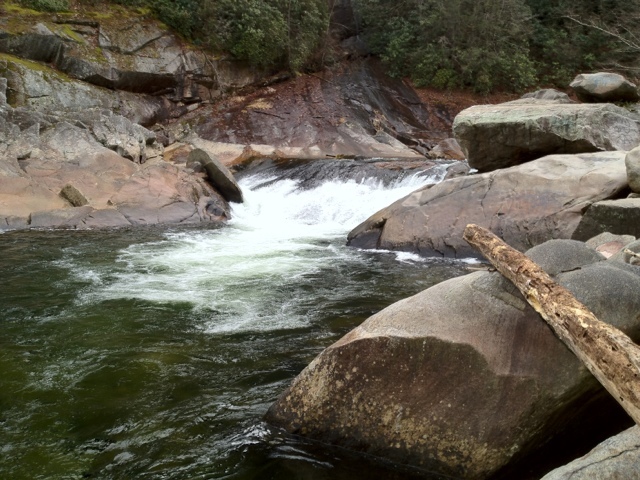 It starts in the park, but leaves the park halfway and into the Pisgah National Forest. The trail is mostly down hill to start, which makes for a difficult return trip. 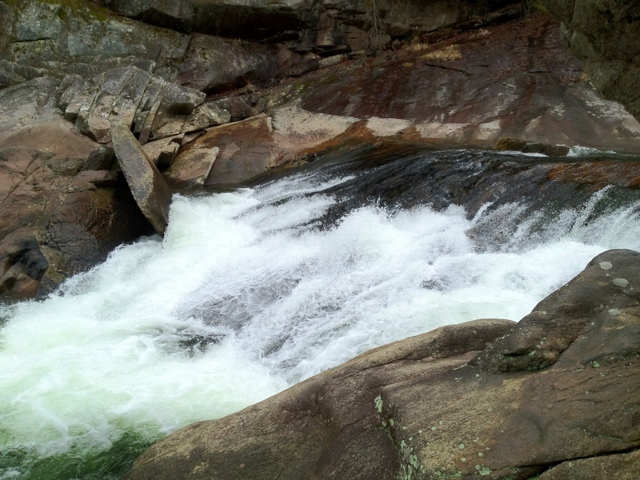 It finally meets up with the Horsepasture River, and the hike goes upstream. 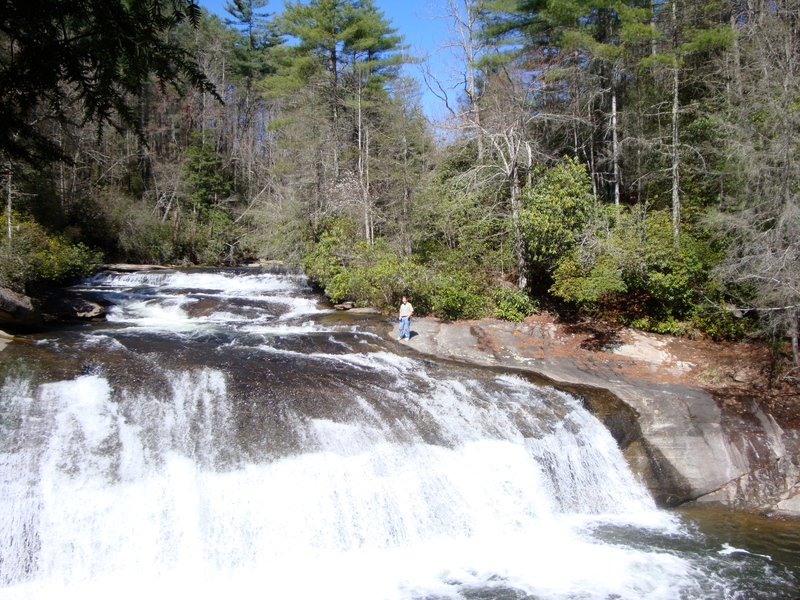 There are a number of smaller waterfalls and large rapids that would be the focal point of parks in other regions, but not here. Once on the river for a ways, the trail begins to climb, eventually gets steep for a short distance. 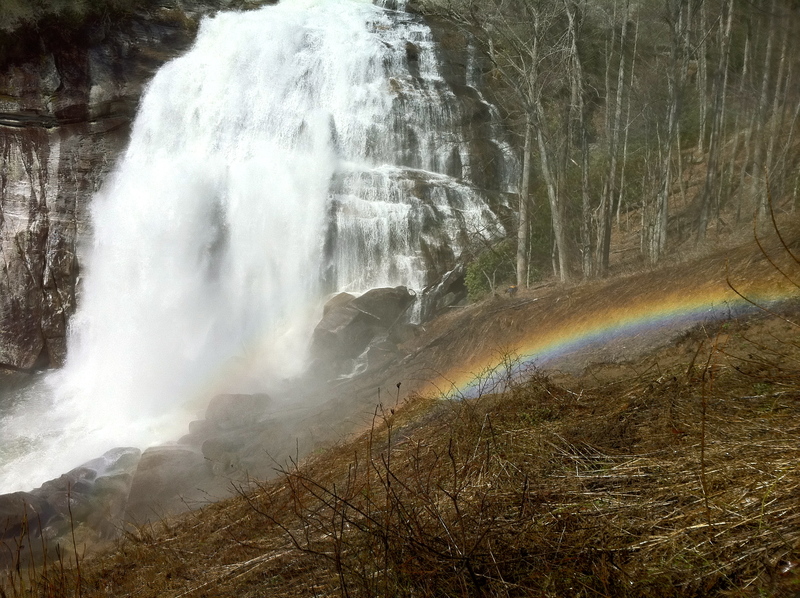 At that point you look over the top and there it is, Rainbow Falls, and all of the thunderous sounds of the water pounding down 150 feet below. Here you will be at an area with a safety fence and is the place to shoot the waterfall if you are lucky enough to be there with the rainbow. Don’t stay long, as you can get drenched, not good for the camera. The trail keeps going up towards the top, but there is also a side trail that goes down to the base. Be careful, use some common sense, and it can be navigated safely. At the bottom, you are close-up to this monster and then you really appreciate it’s size. The walk to the top will cause some huffing and puffing, but the view from the top is magnificent as well. Be very careful, I have read stories of people falling off the top, they did not live to tell about it. 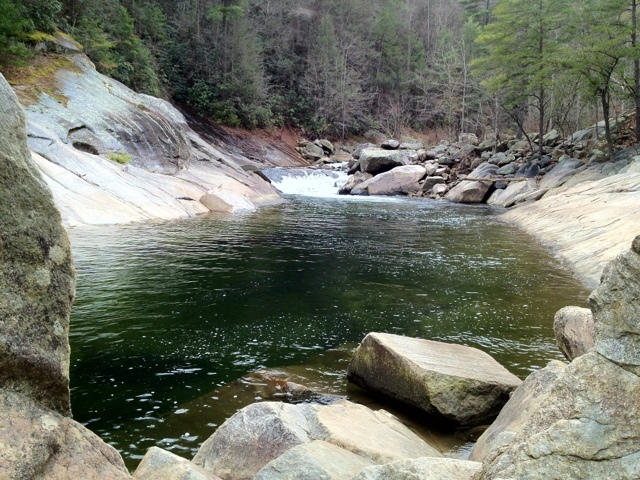 After you take in this beauty, surprise, the Horsepasture river has more in store for you. 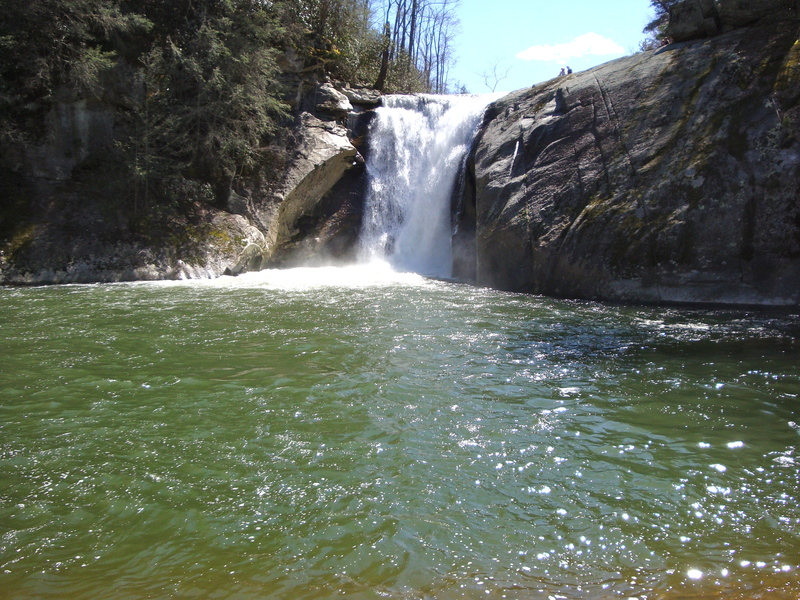 Just upstream from Rainbow, is Turtleback Falls. Although it is much smaller, it has a character all its own and is a beautiful waterfall in its own rights. In the summer, people will slide over these falls into a deep pool. 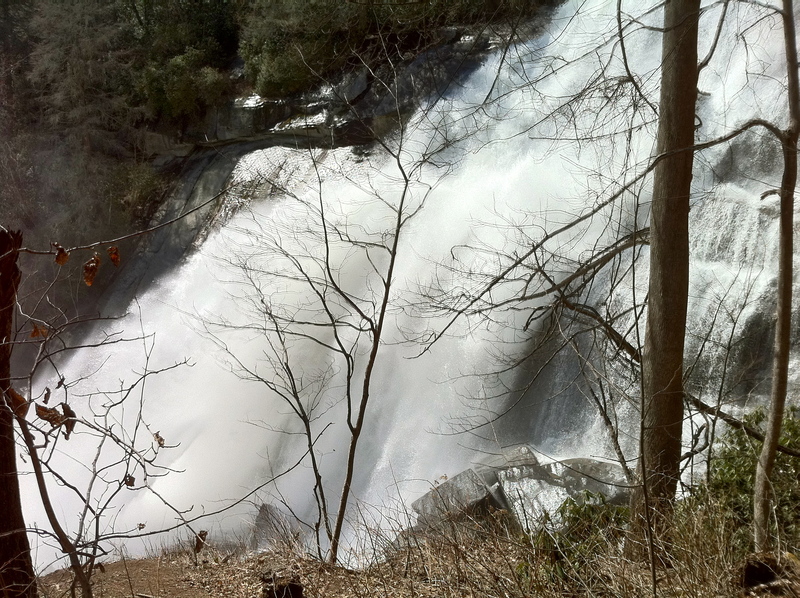 Don’t do this in high water, as I have read that people could not get out, and were swept right over Rainbow Falls. 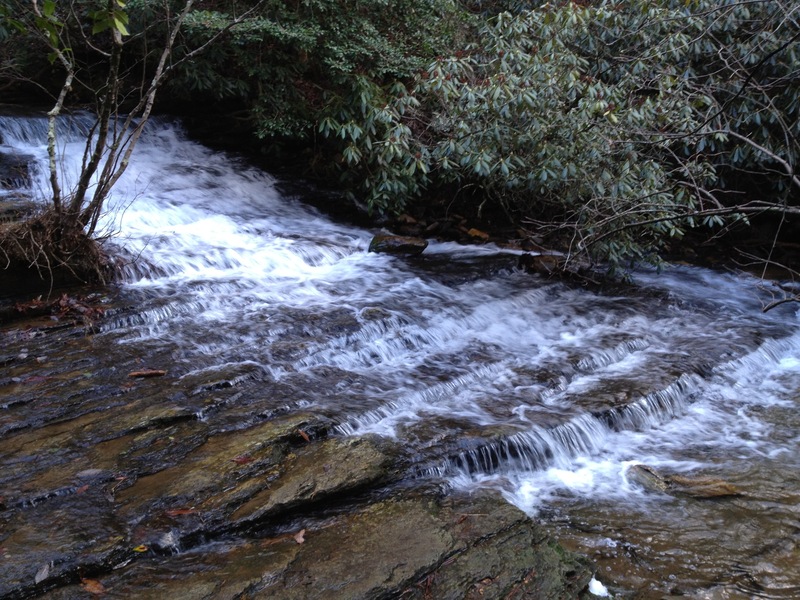 Then….about 1/4 more upstream is Drift Falls. 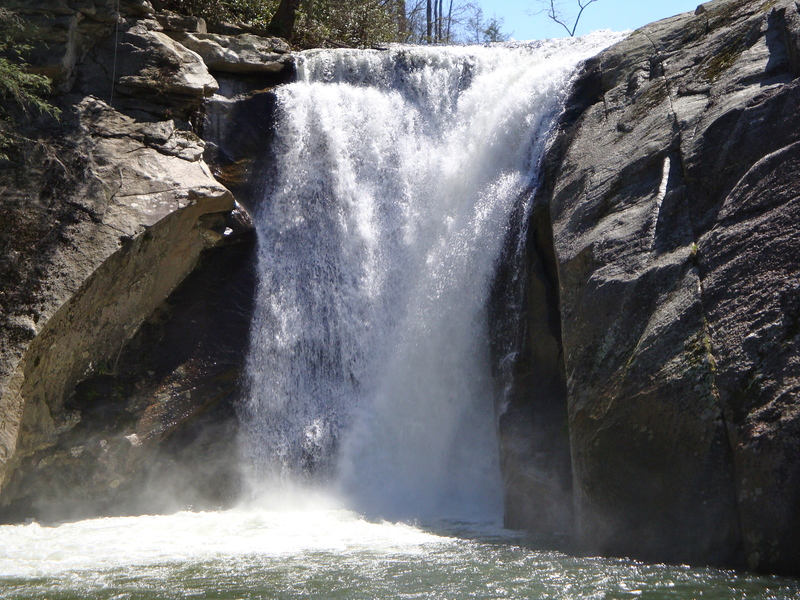 This used to be called “Bustyerbutt” Falls as it was known for people to sliding down a large rock face into a pool. It is the closest to the highway and the waterfall people always saw first on the trip then. It is now on private property, but the park line comes just to the point where you can get a good view of the falls from down stream. 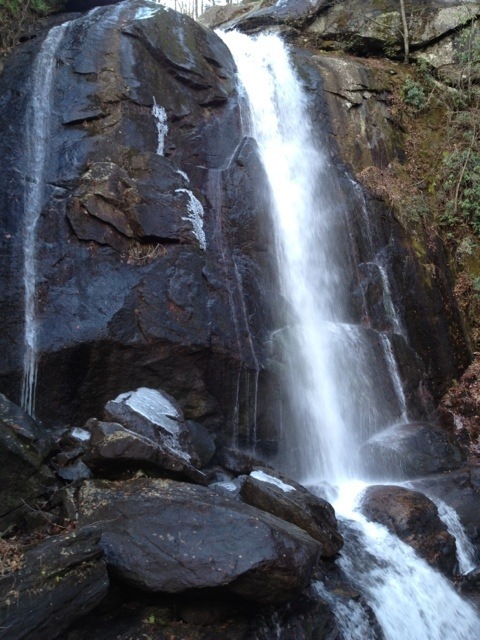 It is a nice waterfall too, but does not compare to the other two. There are two other waterfalls on this river I have yet to see, maybe this year. Stairstep falls, and Windy Falls. They are down stream from where the trail meets the river. Stairstep is fairly close from what I can tell, but Windy Falls is supposed to be quite the adventure. 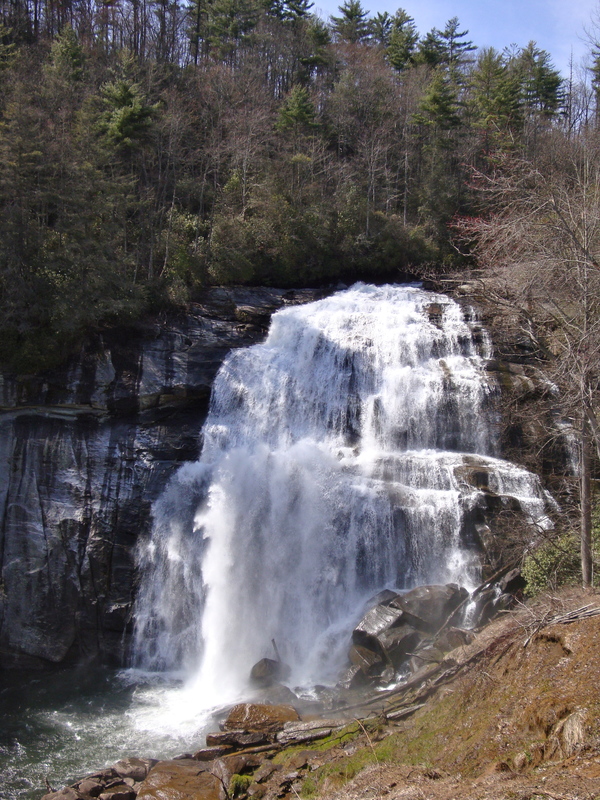 If you make it down to this area of NC, the famous Upper Whitewater falls is just a few miles down the road from Gorges State Park, and is supposedly the tallest waterfall in the eastern US at 411 feet. It is only a short hike to a distant viewing platform, certainly a must-see. Here is an extended gallery of some of my Rainbow Falls visits, along with a few shots of Turtleback and Drift Falls. 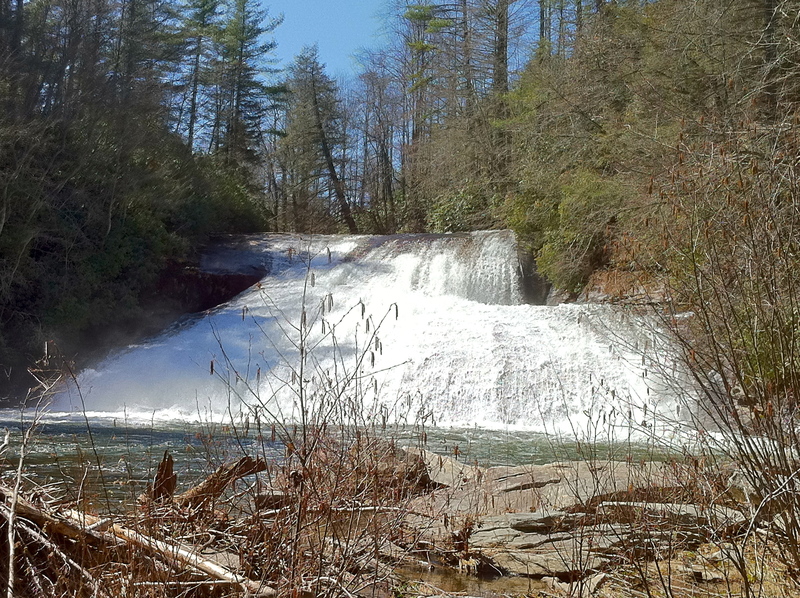 Author waterfallshikerPosted on January 15, 2012 February 28, 2012 Categories Drift Falls, Gorges State Park, Hiking, Rainbow Falls (Horsepasture River), Turtleback FallsTags Gorges State Park, Horsepasture River, Pisgah National Forest, Rainbow Falls (Horsepasture River), Stairstep Falls, Turtleback Falls, Upper Whitewater Falls, Windy FallsLeave a comment on Rainbow Falls – Horsepasture River, North Carolina’s Finest Waterfall?? I was following the advice of a fellow hiker/blogger, Tom Mangan, http://www.tommangan.net/twoheeldrive/. I wanted to create a blog and share my hiking experiences with those that would be interested in them. I remember him telling me to choose a catchy name, but one that does not tell the entire story. While I still do not believe I have accomplished that, I did choose a name that represents what has been the fuel and primary motivation for my hiking, seeing waterfalls. This is how ‘Waterfallshiker” began. I have been an avid “Day Hiker” for several years now. As a Day Diker, I usually do hikes that are in the 5-7 mile range. Some are as short as 1 mile and I have hiked as much as 12 1/2 in a day. This is usually over pretty rough terrain, as I definitely prefer mountain trails over anything accessible at the lower elevations. In the location where I live in western NC, there are endless trails and waterfalls to pursue all within a 3 hour drive at the most. I feel like I have hiked all over the state, yet I know I have only scratched the surface. 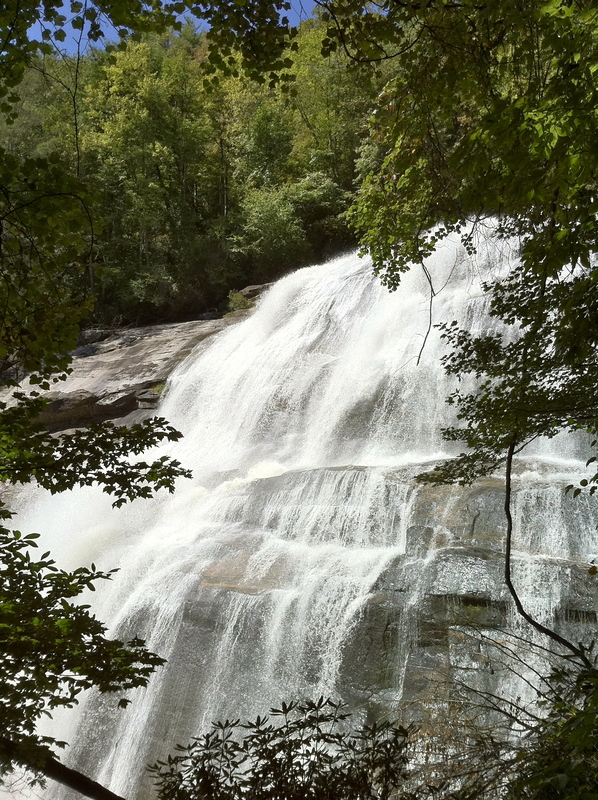 I have seen somewhere in the range of 50 waterfalls in NC. 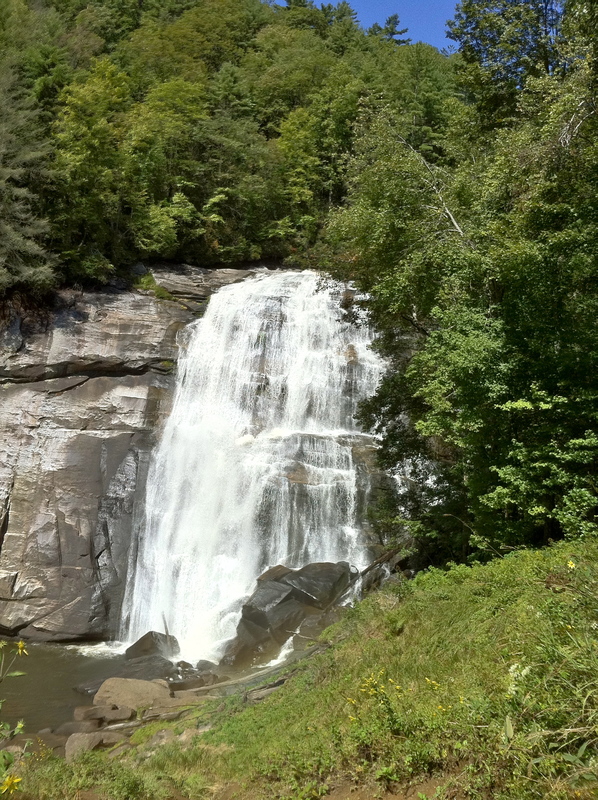 Knowing that Transylvania County has over 250 waterfalls alone, tells me that my feet have much work to do. Why waterfalls? 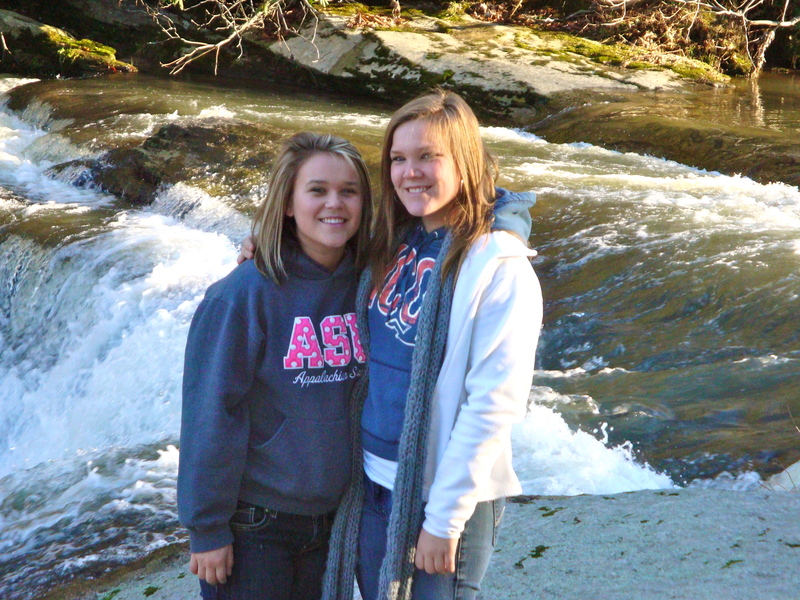 On Christmas day in 2007, I was visiting grandparents in Newland, NC. This is a small town outside of Boone, and usually one of the iceboxes of North Carolina in terms of climate. It just happened to be 50 degrees that day, which is warm for that location and after lunch and the opening of gifts, one of my teenage cousins had an interesting question: “Does anyone want to go see a waterfall? I was intrigued, and quickly replied “why not”. So we were off, two teenage cousins, their father, and myself. The 16 year old drove with myself and James in the back. We took off down a very tight road with many curves. All I can remember thinking was “should she be driving this crazy road or should it be one of us” …. Anyway, we made it safely, and after a short walk, there we stood on the top of Elk Falls. I was taken away. It was stunningly beautiful. The large rocks at the top allow you to literally walk to the edge, although I do not recommend doing this. 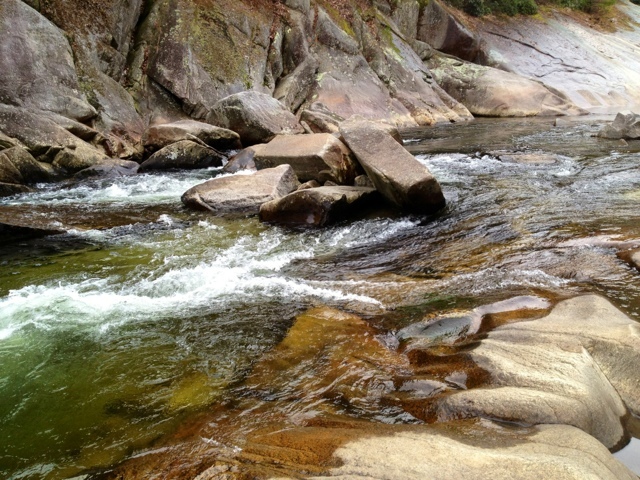 We then took the trail that leads down to the base where a large rock leads halfway out into the Elk River. The view you have at this point is amazing. A very large pool waves up to the rock you stand on and the view of the waterfall was awesome. This is an amazing place to swim in the summer and boy is it packed with people, I later found out. Any way we trekked downstream a bit, I remember stepping on a log that was not stable and my leg went knee deep in the river. 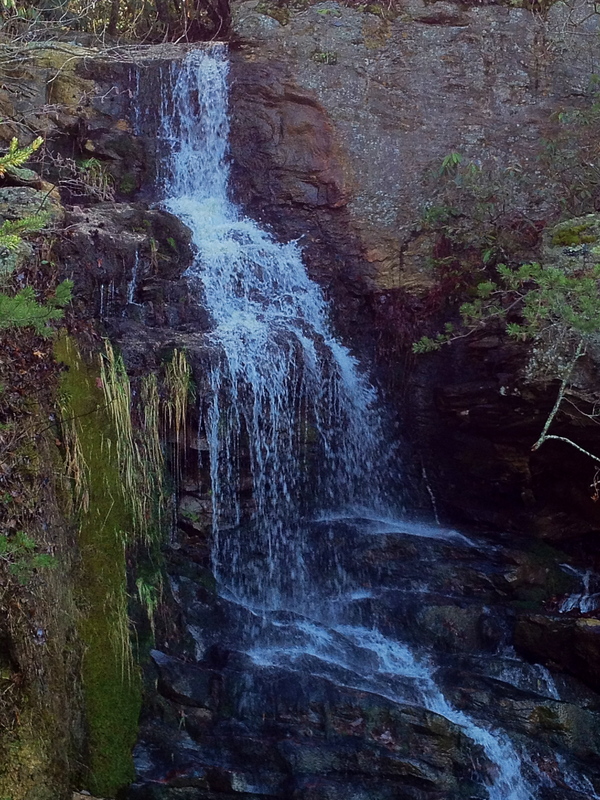 The waterfall was so beautiful though I did not even get pissed, maybe only 1 four letter word, or 2. There is just a special peace of mind when visiting one of these gems up close, certainly an escape from the real world and all of the problems that exist with it. From then, I just wanted to see more. 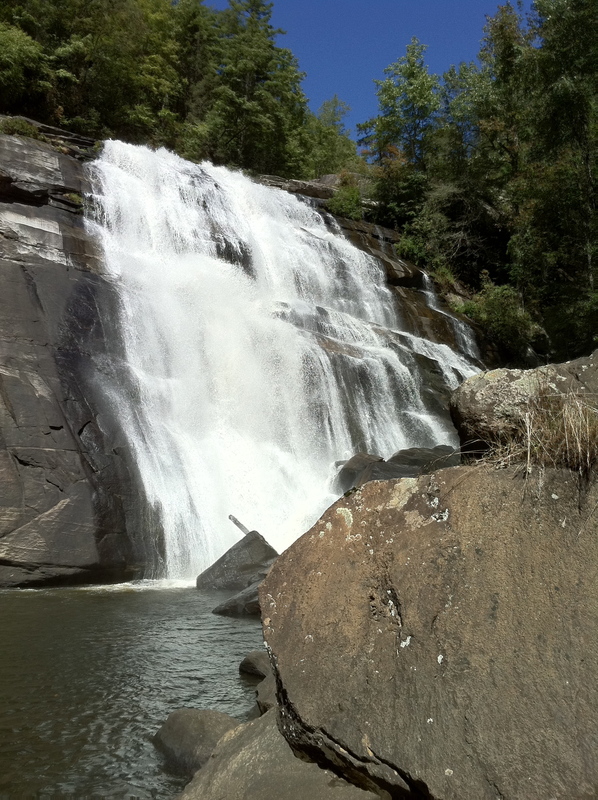 I started searching the web for waterfalls in NC. One of the best resources I found was at http://www.ncwaterfalls.com. This is a website owned by “waterfallrich” or Rich Stevenson, who has been doing this since 1998. 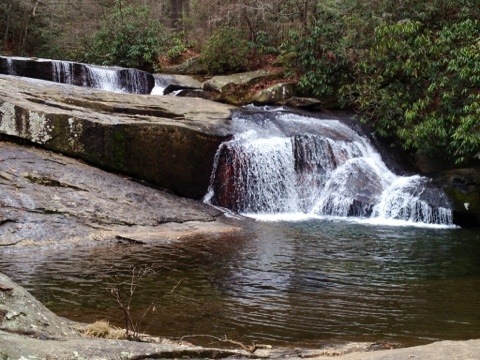 If there is a waterfall in NC and you wish to see it, chances are he has pictures of it and directions of how to find it. It is a great resource. 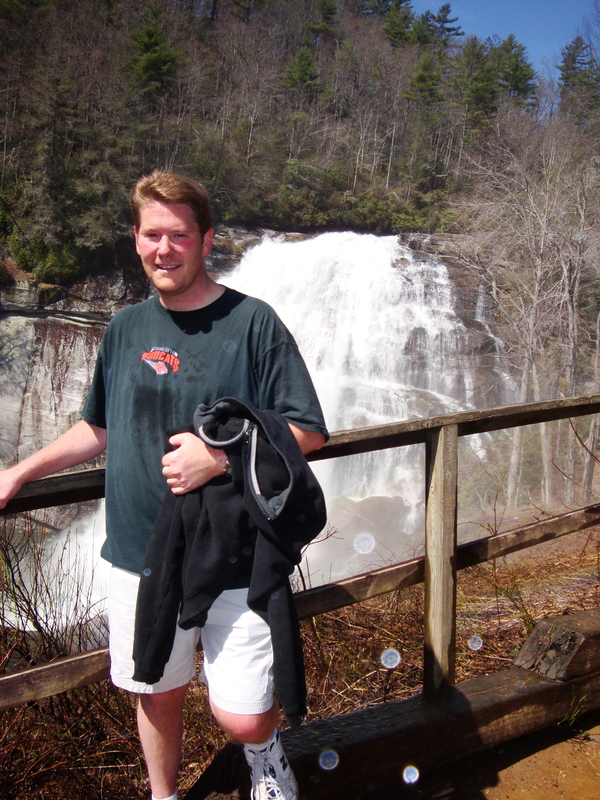 He is now venturing into South Carolina, and Tennessee, which also has some really nice waterfalls. 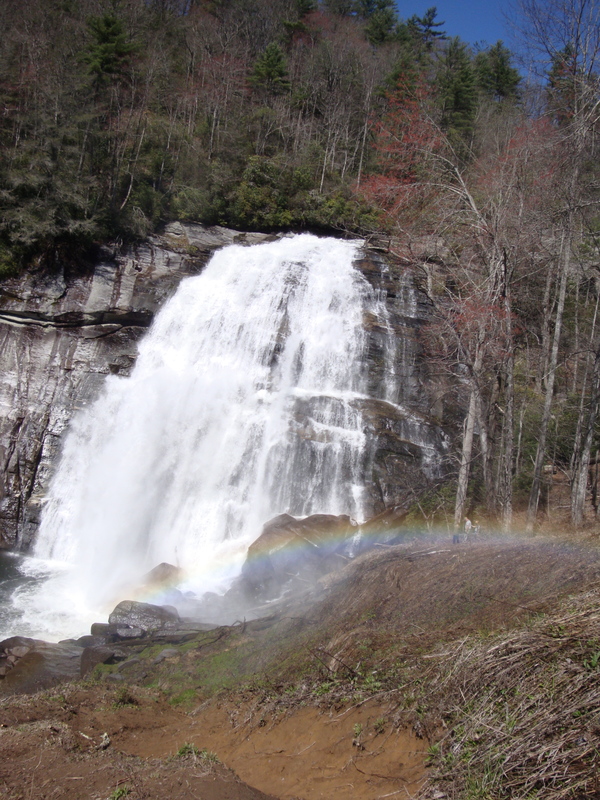 Another great resource, almost of equal value to me is the book, “North Carolina Waterfalls” by Kevin Adams. This book is nearly 600 pages long, considering it is all focused on one state, that should tell you that Mr Adams has covered it pretty well. This book is actually a resource for WaterfallRich as well. I have other books and other websites I use, but these are definitely the main two, and the first two that any newbie should consider. By the way Mr. Adams, if you read this, how about getting your books available on the Kindle or Itunes book store….lol. Now that we have a passion, and the resources, all we needed to find was the free time, and the gas money. The free time was fairly easy to come up with, I just borrowed some of my time playing golf and put it into walking to waterfalls. The gas money was about the same, green fees for gas money, but with prices of gas the way they are these days, car pooling or just not going out as much has been a sad reality. As I look toward the future, I see no reason to slow down though, the mass number of waterfalls left unseen is still very large, there are close bordering states left to explore and plenty of other points of interest (not waterfalls) left to see. I have also found this to be a great way to exercise, although this was never a reason to do this. So check back with me, I will post my experiences and discoveries and along the way, hope to become a better photographer and blogger. Some views of Elk Falls, and those that helped me find the passion for this hobby. 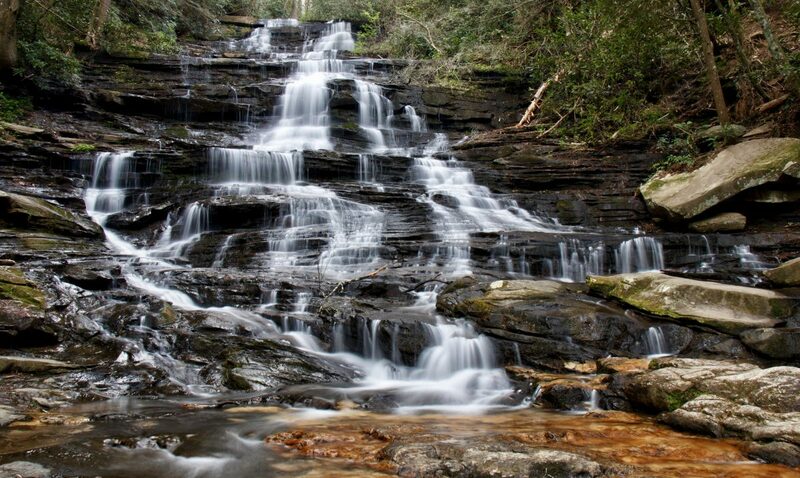 Hanging Rock State Park just north of the triad in NC, is home to 5 named waterfalls. 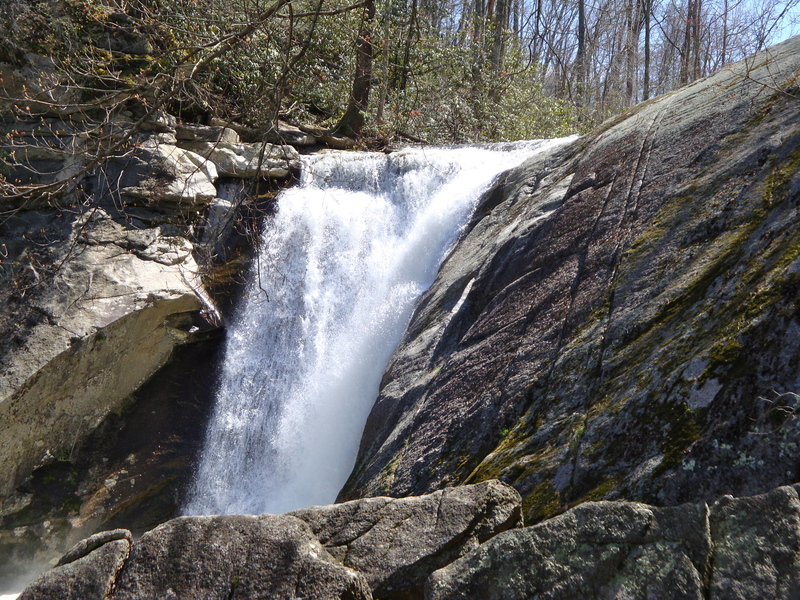 They are small in nature and are nothing like the much larger waterfalls that lie farther west. Several of these 5 falls dry up to merely a trickle in summer, but we had just received 1-2 inches of rain, so curiosity got the best of me. How much of an impact would rain have on these small falls? I had just enough free time after work to ride up, visit 2 of them and find out for myself. Torys Falls is in a remote section of the park which requires a different drive than the regular one into the main park. 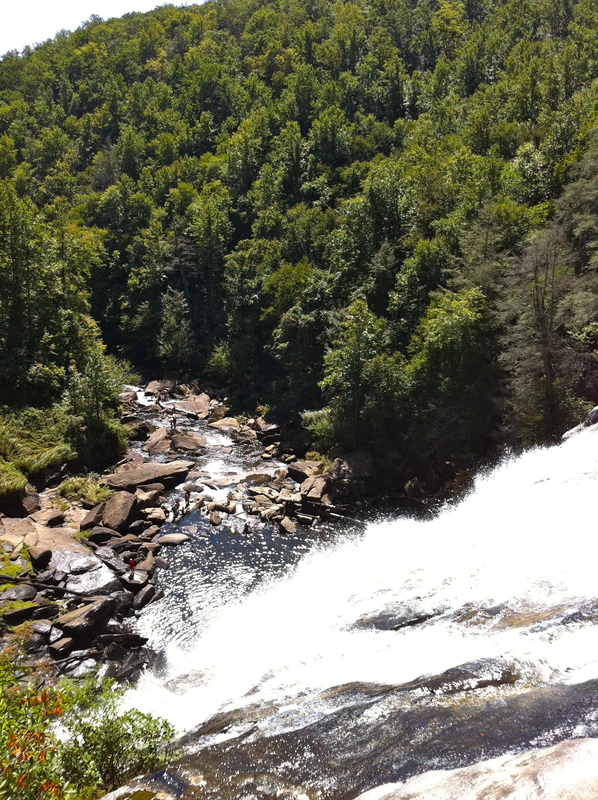 The short hike to Torys Falls is listed as moderate. Once there, you find yourself at a ledge looking at a waterfall over 100 ft tall. It is very tiny though, even with good rain, it was not an impressive flow. 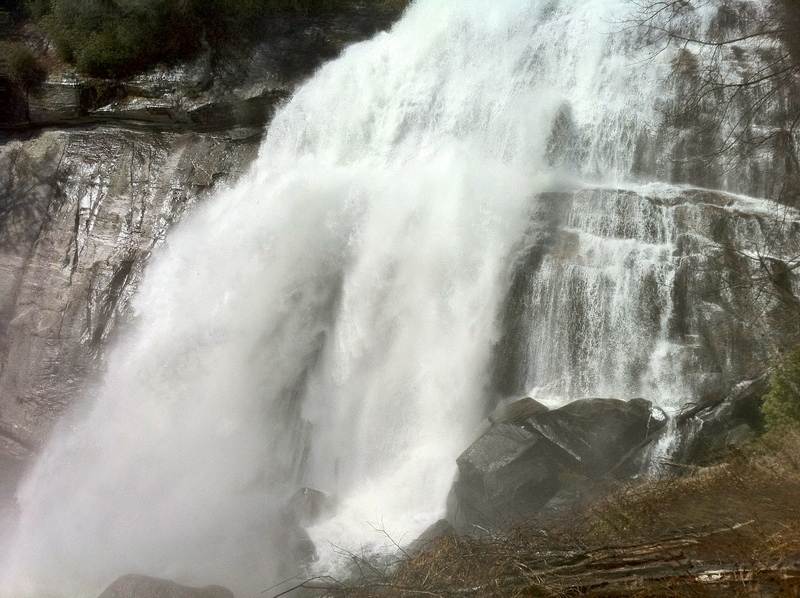 Even though the waterfall is over 100 ft, only about the top 25 feet can be viewed as the rest disappears over cascades into the deep forest. 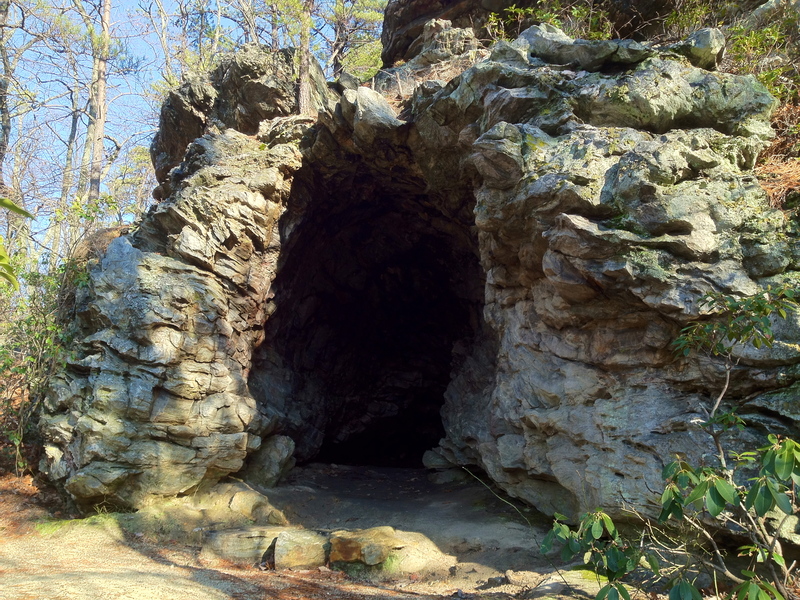 There is another treat here, Torys Den, a cave that was once the “hide-out” of the remaining Tories in the revolutionary war. My next stop was a short drive to the Lower Cascades Parking Lot. 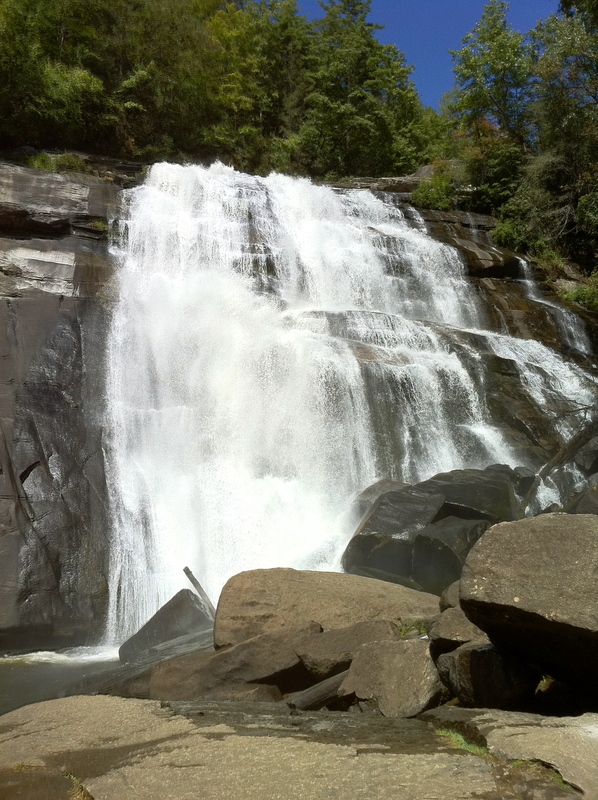 This location, while still outside of the main park, is home to Hanging Rock’s finest waterfall, “Lower Cascades”, a very scenic 35 foot waterfall with a huge overhanging cliff on the left side. Another short hike is on tap here, a tad longer than Torys Den and a tad steeper. Fairly new steps have made this once treacherous trek reasonably safe now. The waterfall could be heard from the parking lot on this day, so I was pretty excited about getting down there. 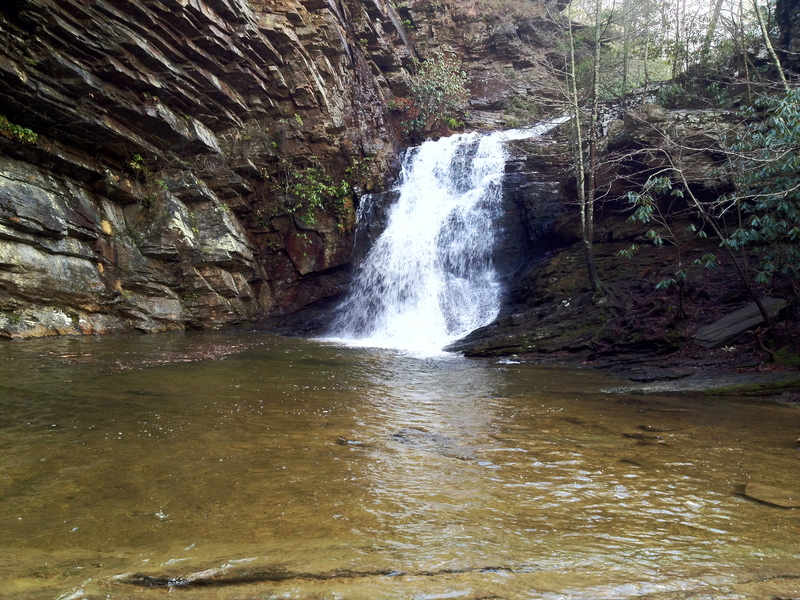 Once there, I could tell the water flow was up and it made for a gorgeous setting. I sat there nearly 15 minutes, took a few pictures, then began my return to the real world. There is definitely some reward to be had, if you are able to get to a waterfall just after a big rain, even on small falls like these. 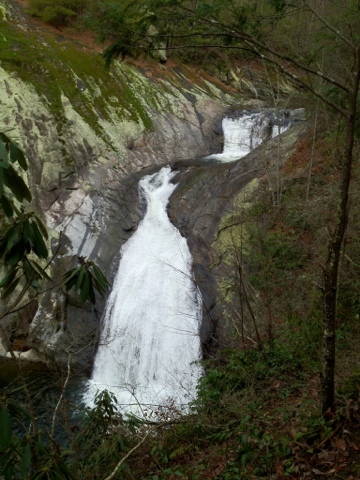 major tributary to Wilson Creek, to view and photograph Harper Creek Falls. The last time I visited this place, there were at least 30 people in my picture, I was hoping this time it would just be the waterfall and I. The trail to the waterfall is roughly 1.7 miles one way with a steep climb right out of the parking lot. It levels out at about the 0.3 mark and is mainly level with few minor hills afterwards.When I arrived at the waterfall, I was in luck, it was cloudy and I was all by myself. It was the perfect chance to get a picture of a waterfall that stays jam packed all summer long. I had one slight problem though. The only way down into the gorge to get the picture is by rope, which is down some very steep rock. I navigated this last summer, but today the rope was cut, in pretty bad shape, and the rock was soaking wet from the earlier rains. It was a recipe for disaster. A younger, dumber me would have gone down it without a second thought. Instead, I did the smart thing, got the best picture I could get and got out of there. Being the only person there made it a bad day for a serious injury. Hopefully my next trip here will provide better conditions. Here are a few photos from my short hike at Wilson and Harper creeks. With the new year now a week old, it became time to make good on some of those “New Year Resolutions”. More miles, more peaks, more waterfalls, better eating….some of the ones I have vowed to do this year. With this weeks nice warm up, it seemed to be the right time to get out and stretch the legs a little. Once you cross the bridge, the trail goes up, rather steeply I might add. The trail does have a lot of rock steps in place to make this as easy as possible, and it is not a long distance to the falls. Before you know it, you will be huffing and puffing your way onto the well-built wooden observation deck right in front of the main waterfall. 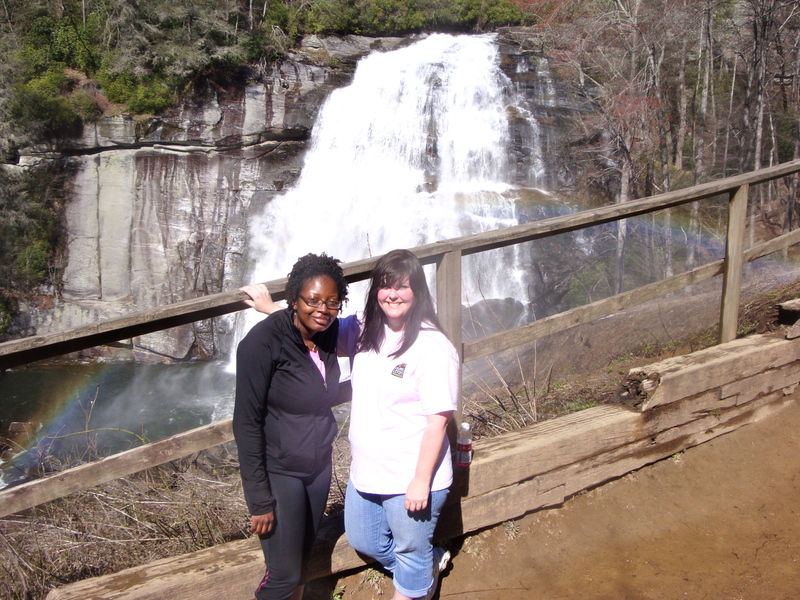 It is this point where you catch a breather and enjoy the falls. On this day, even though it was 65 outside, there was still some remnant ice from a very cold snap we had just come out of. Once we were rested, it was time to climb some more. 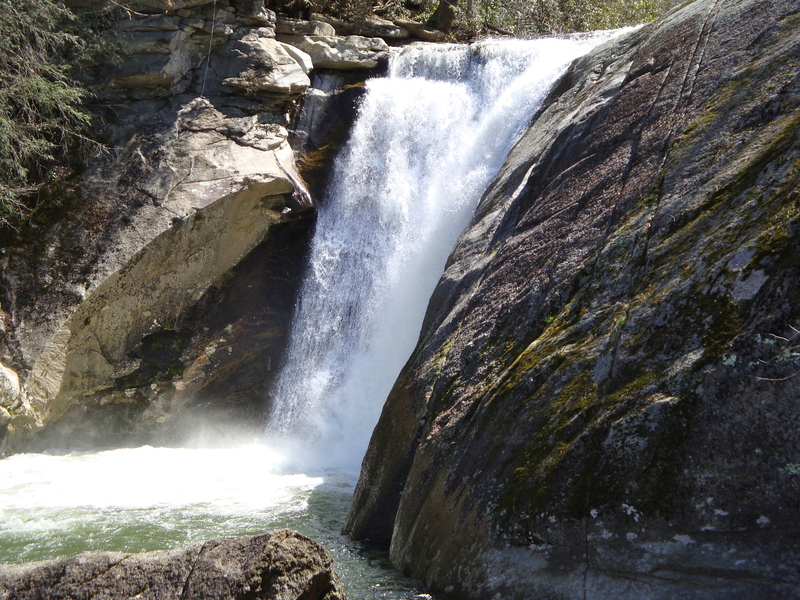 High Shoals Falls consists of two waterfalls actually. 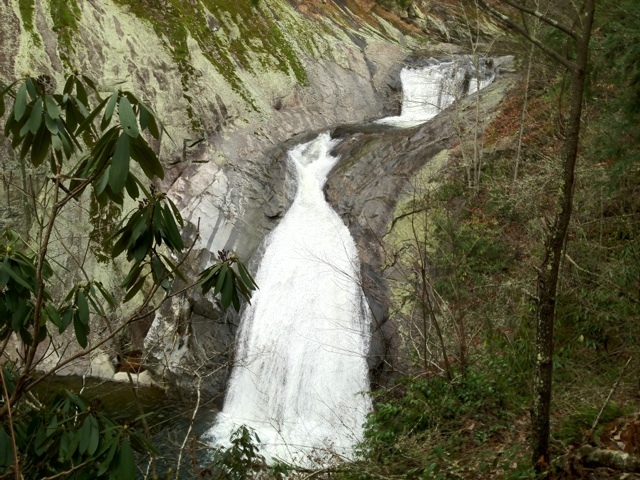 There is the main falls ,and a second part just upstream that some label as “upper falls”. Now to the top, this climb begins very steeply from the deck and is the hardest part of the hike I believe. 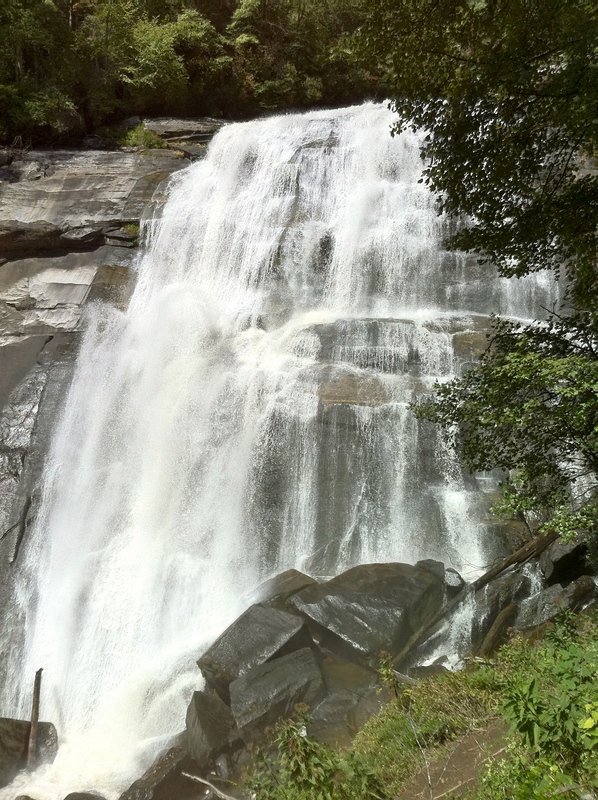 Once you reach the top, there is a very picturesque view of a two-tiered waterfall and a deep, large pool. In the summertime, good pictures are hard to come by because of idiots who ignore the signs to stay out of the water. 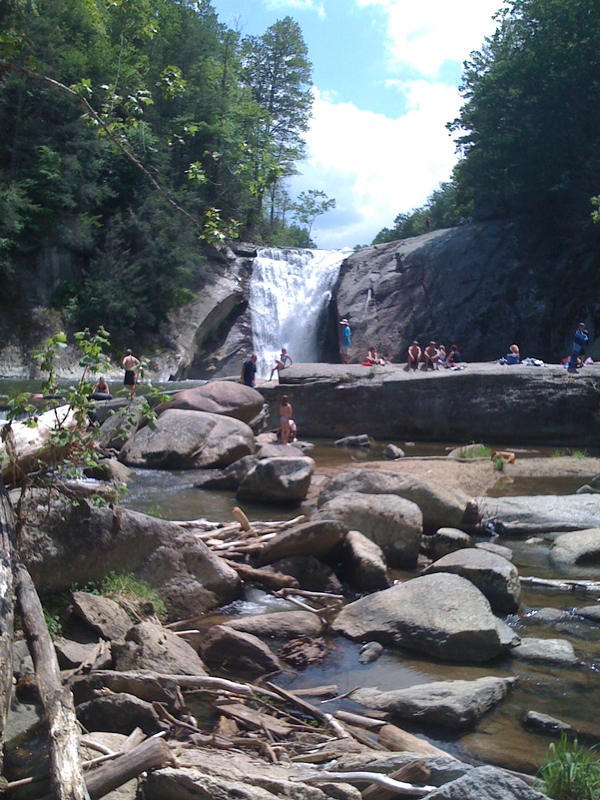 Just past the pool, begins the main falls where people have fallen….. On this day though the pool and it’s icy waters were perfect for the picture taking. At the top of the falls, we cross the stream again on a bridge, then the trail leaves the stream for awhile. After a short, easy climb up to a ridge, you will come to a junction of trails. The High Shoals Loop turns right and begins a descent that is about twice as long as the ascent was, therefore it is not nearly as steep. Once down the mountain, the loop completes itself and it is about 1/4 mile back to the parking lot.